Pallet top caps provide a cost effective solution for pallets that may see a short exposure to either outside elements or that may be warehoused in dusty areas. 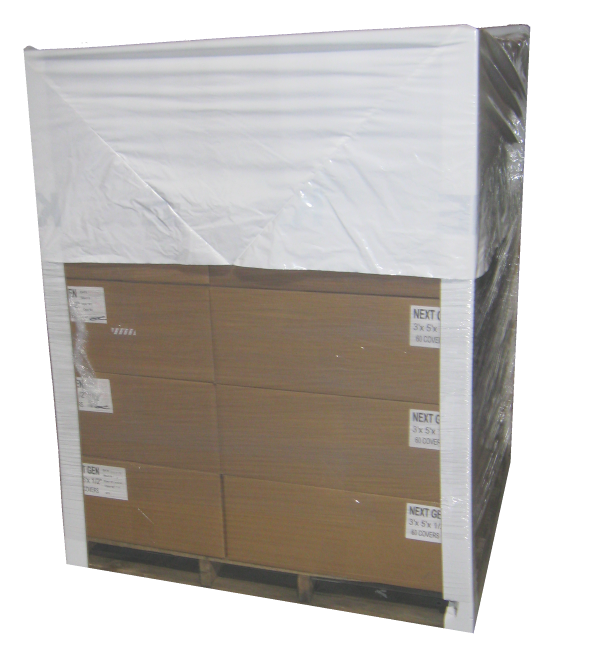 Boxes on a pallet are a great use for this cover, or products that sit in distribution centers. Top caps are water resistant plastic top sheets that are made to square fit standard pallet sizes. High graphic advertisement is also possible with this pallet cover design. If shipping products in plain boxes, as the picture shown above, a top cap can be printed with high graphic print to advertise products while shipping. Top caps can be manufactured in different thicknesses of plastic and can have any print thinkable on each side; one color logos or photo quality pictures are both possible. -First, stretch film the pallet by starting with the bottom. Tie some stretch film to the pallet to begin the process. -Then begin to wrap the pallet. Make sure there is overlap with the stretch film as you move up from bottom towards top. A good rule of thumb is 4-6" of overlap, and make effort to keep the stretch film tight. -Once your reach the top of the pallet, break off the stretch film. You can poke through the film with your fingers if the film is still flat off the role. Tie off or tuck the stretch film inside itself at this point. -Next, apply a top cap to the pallet of goods. And this can be your final step if the Flexpak Top Cap is either tight enough or is fastened down. -Additional step of adding stretch film from bottom to top again can make the packaging stronger, and more water resistant. The more layers around the pallet with stretch film, generally the water resistant the package becomes.